Going on an insight meditation retreat is like traveling with a guide into unknown territory. On a retreat, the guides are the teachers, and the unknown territory is the depth of one’s own heart and mind. The teachers provide guidance in a number of ways—through instruction, teachings, exemplifying the practice, and in their individual discussions with retreatants. During most retreats participants meet with the teachers in order to discuss their retreat practice. 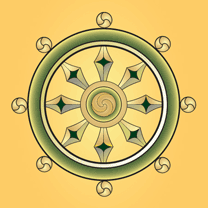 These meetings are referred to as “practice discussions” or “interviews,” and they provide practitioners with important opportunities to explore themselves, the Dharma, and where these two meet. They’re also occasions when retreatants can receive instruction and teachings specific to their individual circumstances. Individual meetings with teachers usually run just shy of fifteen minutes; a lot can happen in that short time, especially if the conversation is focused and explanations are honed to what is most essential. If students make the most of their time by being succinct, this leaves the teacher more time to respond, offering thoughts and suggestions. Some people find it helpful to prepare for the meetings by writing down the main points they want to address. If more than one teacher is leading a retreat, retreatants will have meetings with two of the teachers over the course of the retreat, alternating between them. There are a couple of reasons for this. First, meeting with different teachers allows retreatants to benefit from more than one perspective and approach. While all teachers have a deep understanding of the Dharma, each one’s style and personality are unique. In addition, meeting with different teachers allows participants to focus more on developing their meditation practice and personal relationship to the Dharma than on their personal relationship with a particular teacher. Many factors influence the discussions that take place between teachers and retreatants, and there’s no “set way” for these meetings to go. While the primary purpose of these conversations is to support people’s meditation practice, a wide range of topics may be discussed. For example, conversations might focus on clarifying the instructions or teachings. Or practitioners might report particular meditation experiences and challenges, or they may want to explore personal life issues through the perspective of mindfulness practice. In most cases, retreatants initiate the topic for these discussions. Teachers will respond in a wide variety of ways, depending on their individual teaching styles, the kind of practice being taught on the retreat, and their best judgment about what would be most helpful. Depending on what the student presents, the teacher might simply listen deeply, offer understanding and encouragement, ask questions, probe into the issue that’s been raised, give instruction and guidance, challenge, or simply affirm the experience or wisdom of the practitioner. Sometimes these meetings with teachers stir up anticipatory thinking, feelings, or anxiety. I’ve had people tell me they spent hours thinking about their interview. These thoughts and feelings can be seen as an integral part of one’s Dharma practice. Rather than considering them distractions from meditation, they can be treated respectfully as something to be mindful of. These are areas of the inner life in which to discover freedom and peace. It can be useful to tell the teacher when there is a lot of thinking, planning, and anxiety prior to the meeting. He or she may simply acknowledge the information and let the conversation move on to something else, or might choose to stay with the issue for further discussion or guidance. This is useful, because by bringing mindfulness to their relationship to a teacher, practitioners can learn how to practice with other interpersonal issues in their lives. Now and then, a teacher will give particular instructions for how practice discussions are conducted, but if no instructions are provided, retreatants are free to bring up any topic they think will support their meditation practice or any issue they wish to explore from a Dharma perspective. A meditation retreat is usually not the time for abstract discussions about the Dharma or for long explanations about past events. Because the very purpose of retreats is to deepen one’s own personal practice, it’s much more useful to discuss topics that have direct relevance for one’s practice and life. So what do people talk about in these interviews? Sometimes they ask questions about their meditation experience, or the instructions, or the teachings. If they don’t have questions they might simply report how the practice is going. This can be a brief description of what meditation approach they’re using and the intention they have for their practice. Even if practitioners are following meditation instructions given by the teacher, when they explain the practice in their own words, the teacher can then offer input and refine the instruction. These reports can also include an account of what the person finds challenging and what is going well. If a practitioner notices that his or her reports are always focused on what is challenging—or the opposite, on what is going well—it can be useful to look at this and to consider what is being left out. Sometimes meetings with teachers focus entirely on what is happening right there in the present moment, during the practice discussion itself. This can be a mindful exploration of what the student is experiencing in the moment instead of a discussion or analysis of it. In the same way that a practitioner tries to stay attentive for the present moment experience in meditation, he or she can also do this during the discussion with the teacher. The teacher might ask questions or guide this exploration. The willingness to be honestly open about one’s present moment experience in the presence of a teacher can help a practitioner develop a profound trust in the potential of mindfulness. Occasionally a person’s retreat practice unfolds so that very little at all is said during these meetings. This might happen when mindfulness, concentration, and inner freedom are strong enough to evoke a profound peace where nothing needs to be discussed and nothing needs to happen. Rather, the practitioner stays in touch with his or her inner stillness and lets whatever is spoken emerge out of that peace. If nothing is said, the inner state communicates for itself. When appropriate, the teacher’s inner freedom may meet the state of the practitioner so the distinction between teacher and student falls away. The role of a teacher on retreat is to serve and support the practice and awakening of everyone participating in the retreat. Practicing on retreat is one of most noble and sacred things a person can do. For teachers, meeting with those who do this practice, whether they are new to retreats or well experienced, is a great honor.